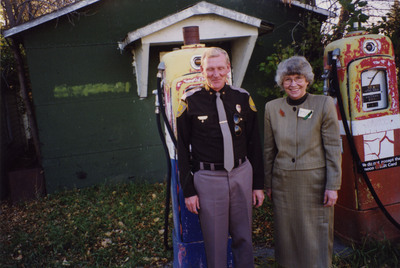 "Rosemarie Myrdal with North Dakota Highway Patrol"
Picture of Lieutenant Governor Rosemarie Myrdal and Colonel Jim Hughes of the North Dakota Highway Patrol. Information taken from back caption of photo. Jim Hughes, the commander of the state Highway Patrol, was named to the job by Governor Ed Schafer in 1993. He served with the Highway Patrol for thirty years and retired in 2003.